Hello all! In the middle of working with my new Papertrey Ink release goodies! 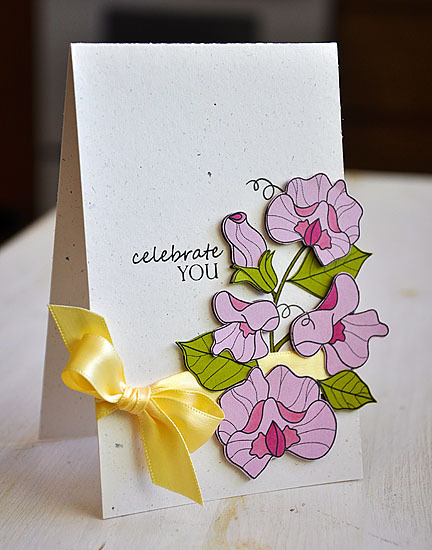 Just thought I would pop in and share another Papertrey Ink creation with you all today... Today's card features Year Of Flowers: Sweet Peas. 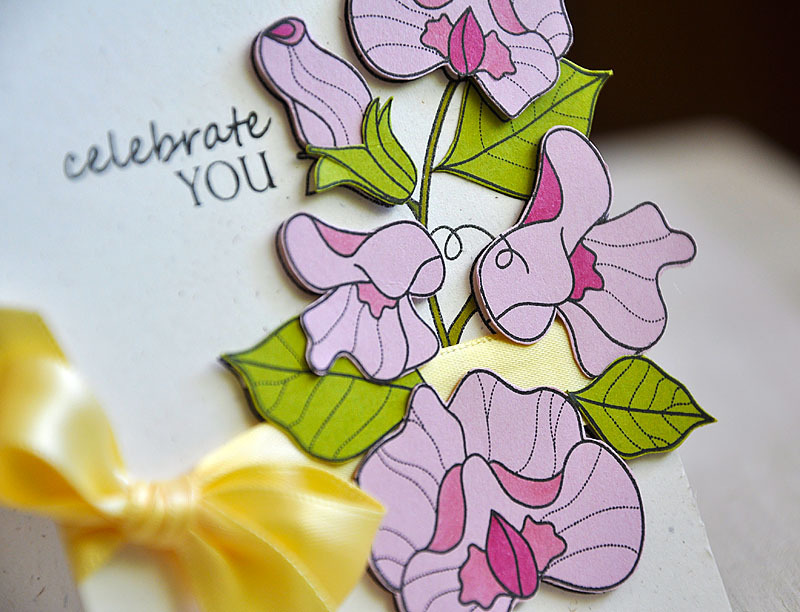 Stamped the sweet pea image onto a Rustic Cream card base, in Palette Noir, and colored the stem. Wrapped the base with Lemon Tart satin ribbon. Stamped the sweet pea image, again in Palette Noir, onto Lavender Moon & Simply Chartreuse cardstock. Touched up each flower with a few Copic markers, cut out and assembled onto the card base. Finished it off with a sentiment from the same set. Hope you've enjoyed today's card, have a wonderful day! This is beautiful, Maile! I love the dimension and the pop of color you added to the cardstock with copics. You've some serious talent, girly. Gorgeous! I love all the dimension you gave it! gorgeous. i love how you wove the ribbon in! I love your cards they are always so cheery! Love the bright colors! This is gorgeous!! Love it! So beautiful, Maile! I will have to try using my Copics like this on colored cardstock, since my coloring skills are still pretty limited! I love the yellow ribbon you added, too! simply beautiful!! love the fab design and the dimension! The card is absolutely gorgeous... !!!! Loved the colours...simple yet elegant :) Lovely !! Love the flowers off the edge and that you added copics to the colored paper, brilliant!